Peijnenburg AA, Bron S, Venema G. 1987. Structural plasmid instability in recombination- and repair-deficient strains of Bacillus subtilis. Plasmid 17(2):167-170. Although a bacterial culture on a petri dish, slope or stab culture is in a closed environment and may start healthy, over time, the number of viable cells will decrease to zero as nutrients are being used up. The goal of preserving the cultures in a frozen state is to slow their metabolism and, in relation to that, their death rate so that when the culture is revisited, some of the cells are still viable and available for culturing. The reasons the cells die can be numerous, but in every instance are based on the inherent chemistry of the cells and their environment. If the deleterious chemical reactions can be slowed or halted, then the overall culture will remain viable for a longer period of time. 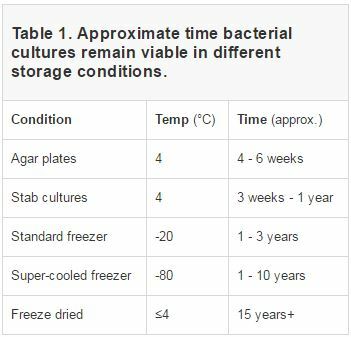 As a general rule, the viable storage period of bacteria increases as the storage temperature decreases. Once the temperature is below the freezing point, however, cryoprotectants are essential to reduce cell damage caused by the freezing process. In addition to the other comments and answers, cryopreservation tubes tend to be much smaller and take up far less space than an agar plate or stab cultures. Not the answer you're looking for? Browse other questions tagged molecular-biology microbiology synthetic-biology or ask your own question. How do I “reinoculate” a petri dish with new bacteria?